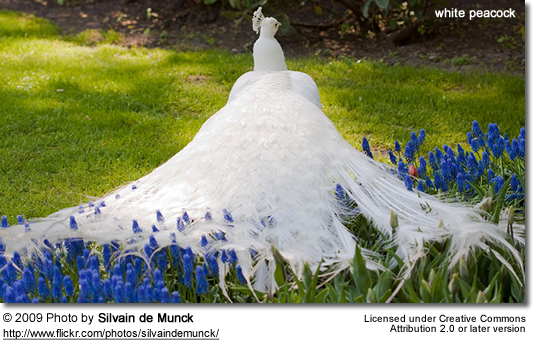 Peafowl are best known for the male's extravagant tail, which it displays as part of courtship. 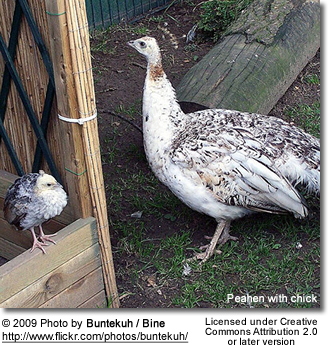 The male is called a peacock and the female a peahen, although it is common to hear the female also referred to as a "peacock" or "female peacock". 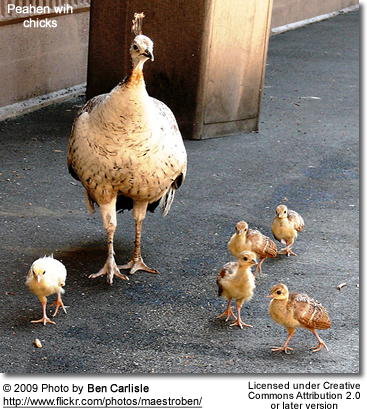 The female peafowl is brown or toned grey and brown. 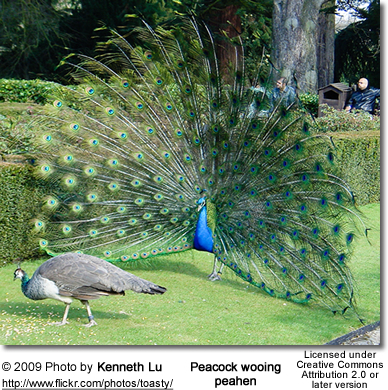 The male (peacock) Indian Peafowl has iridescent blue-green or green colored plumage. 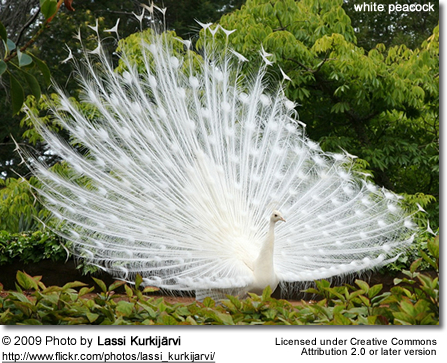 The so-called "tail" of the peacock, also termed the "train", is not the tail quill feathers but highly elongated upper tail coverts. 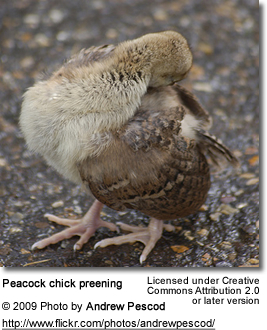 The train feathers have a series of eyes that are best seen when the tail is fanned. Both species have a head crest. 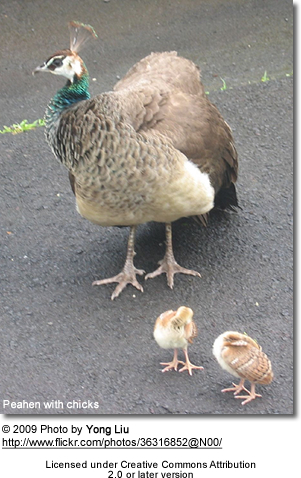 The female (peahen) Indian Peafowl has a mixture of dull green, brown, and grey in her plumage. She lacks the long upper tail coverts of the male but has a crest. 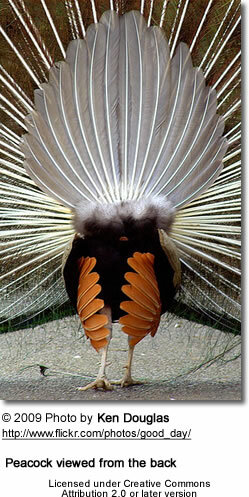 Females can also display their plumage to ward off danger to their young or other female competition. 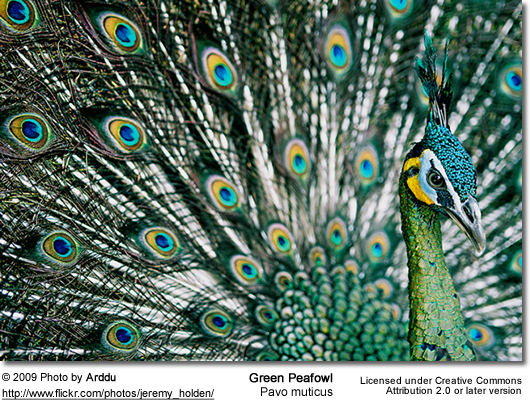 The Green Peafowl is very different in appearance to the Indian Peafowl. 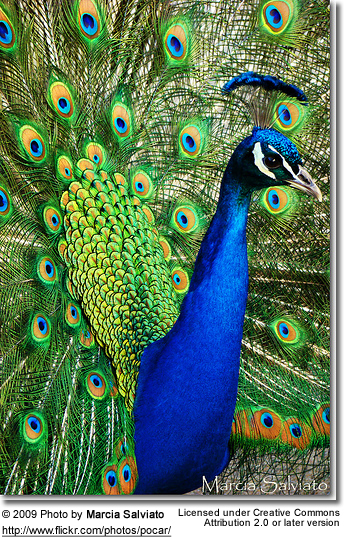 The male has a more green and even gold plumage than the Indian Peafowl and even more brilliant color. The wings are black with a sheen of blue. The crest is of a very different shape and is tufted. Unlike the Indian Peafowl, the Green Peahen is very similar to the male, only having shorter upper tail coverts and less iridesence. It is very hard to tell a juvenile male from an adult female. Different colours correspond to different length scales of the periodic structures. For brown feathers, a mixture of red and blue is required: one color is created by the periodic structure, and the other is a created by a Fabry-Perot interference peak from reflections off the outermost and innermost boundaries of the periodic structure. 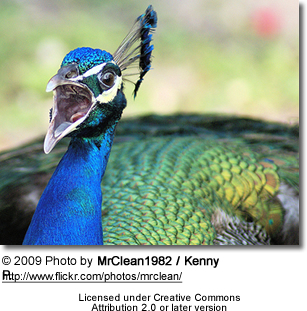 The peafowl are forest birds that nest on the ground. 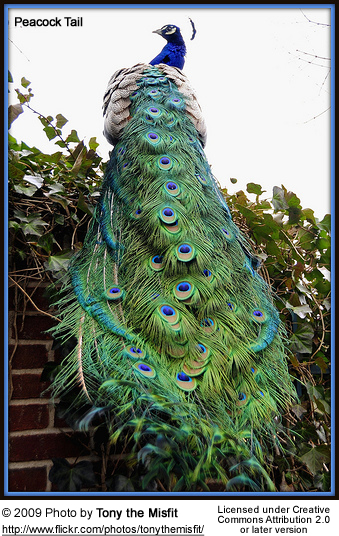 The Pavo peafowl are terrestrial feeders but roost in trees. 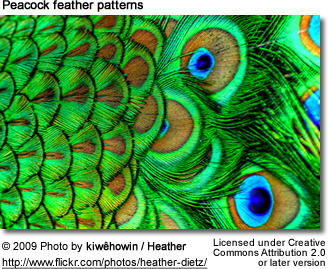 Both species of Peafowl are believed to be polygamous. However, it has been suggested that "females" entering a male Green Peafowl's territory are really his own juvenile or subadult young (K. B. Woods in litt. 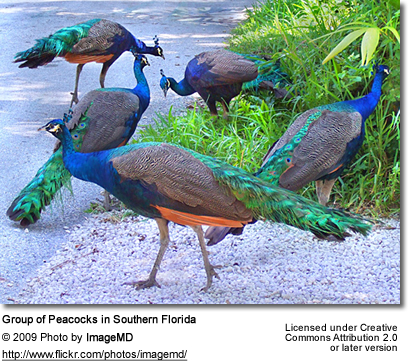 2000) and that Green Peafowl are really monogamous in the wild. Those who subscribe to this notion cite the similarities between the sexes. 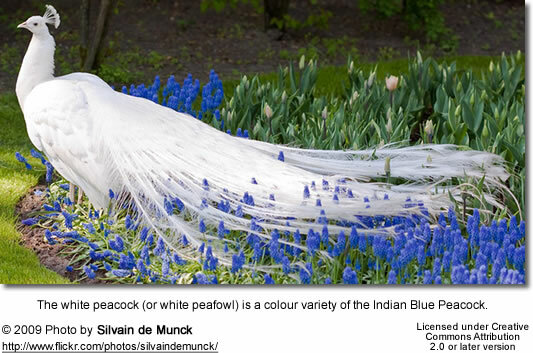 Peafowl are omnivorous and eat plant parts, flower petals, seed heads, insects and other arthropods, reptiles, and amphibians. 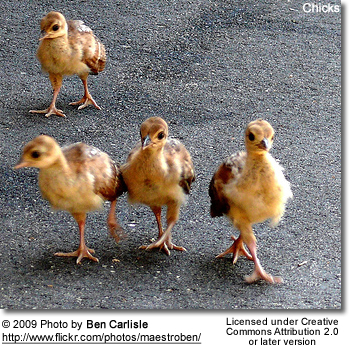 In common with other members of the Galliformes, males possess metatarsal spurs or "thorns" used primarily during intraspecific fights. Asiatic peafowl like the Indian Blue Peafowl and especially the Green Peafowl occupy a similar niche as the roadrunners, secretary bird, and seriema. All of these birds hunt for small animals including arthropods on the ground and tall grass and minnows in shallow streams. 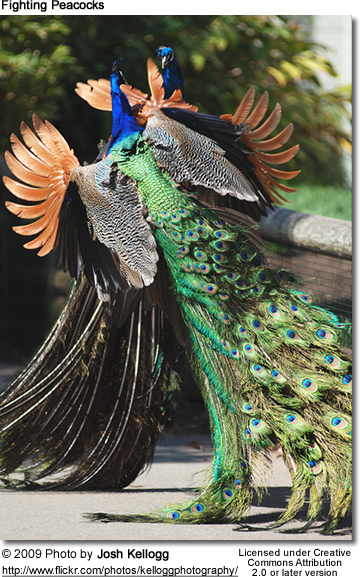 Because of human encroachment into their natural territories, peafowl and humans have come into increasing contact. Because of their natural beauty some are reluctant to classify the birds as pests, but their presence can be disturbing.